Best Value! 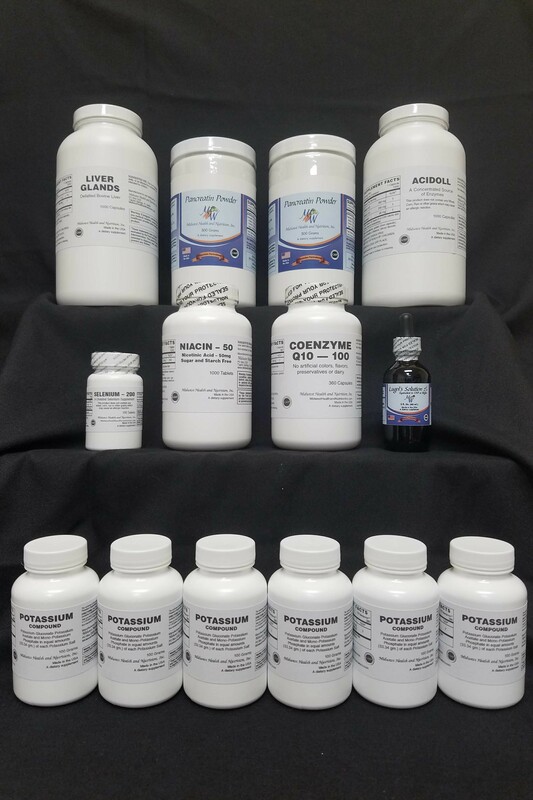 Like our 90 Day Gerson Basic kit, The 90 Day Advanced Protocol Kit 2 includes all of the core supplements for the Gerson Therapy in a 90 day supply (other than thyroid), at the same discount percent off retail prices as you find in the 90 Day Gerson Basic kit. The differences between this kit and the Basic kit are: 2-Pancreatin Powder- 500 grams (replaces 1-Pancreatic 325 mg 1000 count tablets) and 1-CoQ10 100 mg 360 count capsules (replaces 1-CoQ10 60 mg 360 count capsules.) Due to the extreme value of this kit, no additional discounts or promo codes will apply to this kit. See Product Description below for complete contents of the kit. Kit includes: 1 Acidoll capsules-1000 count, 2 Pancreatin Powder-500 grams, 1 Defatted Liver capsules-1000 count, 1 CoQ10 100 mg capsules-360 count, 6 Potassium 3 Mix Compound-100 gram bottles, 1 Lugol's solution 2%-2 fl oz, 1 Selenium 200 mcg tablets-100 count, 1 Niacin-50 tablets-1000 count.